Architect's rendering of the proposed "green walls" plan for the Georgetown rail corridor. Story by Corey Horowitz. Images courtesy of Brown+Storey Architects. Transportation is a hot button issue in Toronto these days, with a range of transit projects and congestion-clearing strategies gaining traction. Metrolinx—the GTA’s regional transit authority tasked with helping to alleviate our transportation logjam—is currently working on an expansion project for the Georgetown South commuter rail corridor, which provides Go Transit service through west Toronto out to Kitchener. This will enable the capacity needed for the Union-Pearson Express air-rail link, slated to start carrying passengers ahead of the 2015 Pan Am Games in July. The Georgetown corridor passes through numerous established Toronto neighbourhoods including Parkdale, High Park, the Junction Triangle and Weston-Mount Dennis. As can be expected, there has been a degree of community resistance to certain aspects of the project. In particular, the approach taken by Metrolinx to noise mitigation, safety and the accompanying aesthetics of the corridor’s barrier walls has been a source of objection. One response has come through the Junction Triangle Rail Committee and the Wabash Building Society, two local groups that have commissioned Brown+Storey Architects to study the shortcomings of, and possible alternatives to the Metrolinx plan. 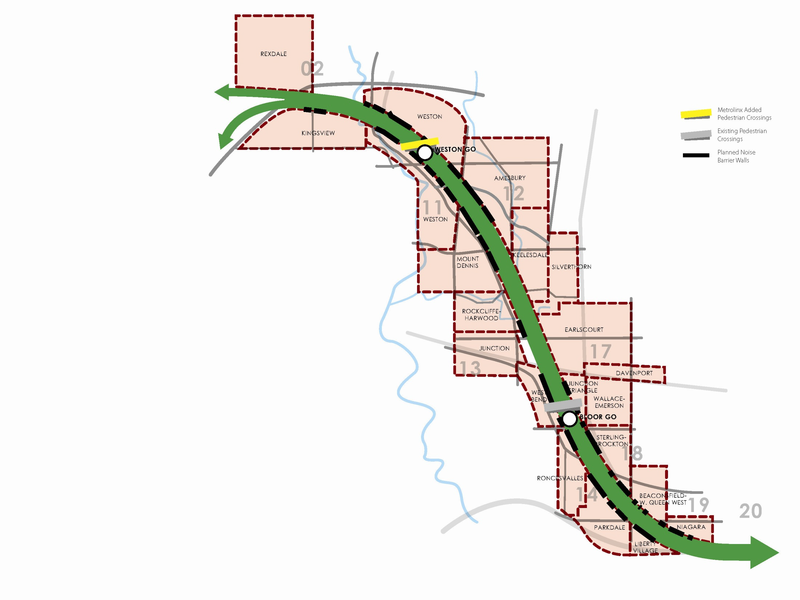 The Metrolinx LRT route and adjacent neighbourhoods, showing the planned noise barrier walls and existing pedestrian crossing. Click on the image to zoom in. In question is the proposed design for construction of conventional 5 metre (16 feet) high concrete or vinyl barrier walls that will impinge on significant stretches of residential areas, with the potential for negative impact on neighbourhood visuals and quality of life. Brown+Storey architects have re-imagined the design of the rather harsh edge proposed for the corridor while maintaining its function as a sound and safety buffer. The alternatives presented envision a hybrid of the technical requirements of the walls and a more appealing, naturalized finish that also opens the door for the inclusion of public space and multi-modal transportation options (aka bikes and walking). A rendering of how the green buffer might look. Click the image to zoom in. Traditionally, transit infrastructure in Toronto has been built at odds with the neighbouring urban fabric, relying on strict separation from other land uses -- one obvious example being the imposing concretized boundary-to-the-lake represented by the Gardiner Expressway. Contemporary approaches to landscape and infrastructure embrace a new relationship in which transportation and cultural activities can coexist, allowing for more creative and economical use of the city’s limited land supply. Enter Brown+Storey’s “green walls”. The concept intends to make the plain concrete walls—which are mandated by the Ministry of Transportation along several stretches of the 25-km rail line—more palatable to nearby residents. The green walls will utilize vegetation growing inside metal cages along with about 10,000 trees lining the corridor. 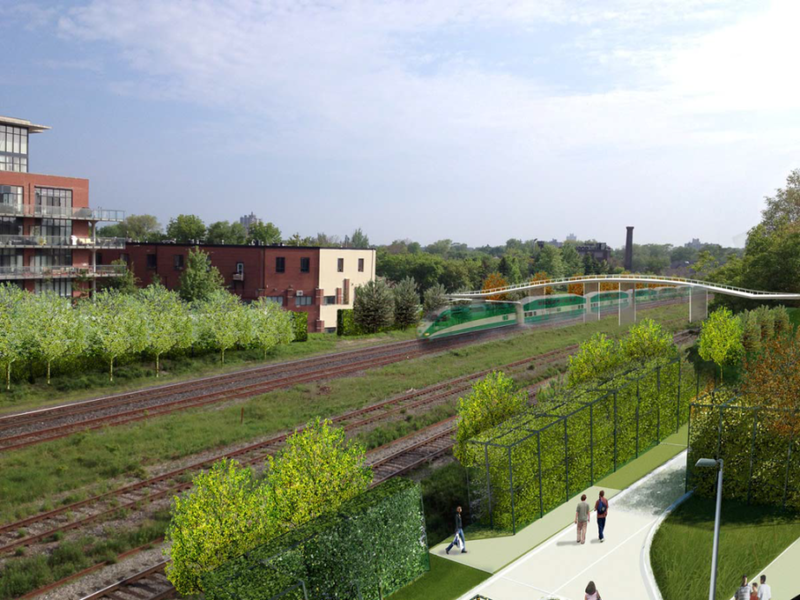 Also incorporated in the design are seven new pedestrian bridges adjoining both sides of the track, as well as pathways forming a linear park. Route map showing proposed additional pedestrian crossings, multi-use trails and locations of improved underpass and on-street pedestrian-cyclist facilities. Click the image to zoom in. The trail system, with a pedestrian-cyclist component, could greatly enhance this piece of infrastructure through a useful layer that would add social and economic value to the neighbourhood. The West Toronto Railpath—also designed by Brown+Storey along with Scott Torrance Landscape Architects—is evidence of such benefits that can accrue from investment in innovative public infrastructure. Since opening in 2011, the Railpath has been a catalyst for brownfield redevelopment along its borders, and the creation of an interesting contrast between the industrial landscape and pedestrian activities. This notion clearly resonates with Kim Storey, who says, “The West Toronto Railpath has demonstrated that there is real public value in getting close to the railway, in accepting it as a ‘front’ for neighbourhoods (not just a ‘back’) and in leveraging this infrastructure into a public space that can encourage reinvestment. The spaces that border Toronto’s rail corridors are an under-exploited opportunity to re-connect neighbourhoods in their immediate context, and to make unique trans-City linkages with active transportation corridors at a civic scale." "We think that railway operations should be as responsive to the needs of the city as the city is asked to be accommodating of the railway operations, and that this philosophy (rather than avoidance and exclusion) should be driving our zoning and design decisions,” says Storey. And we at dandyhorse tend to agree. 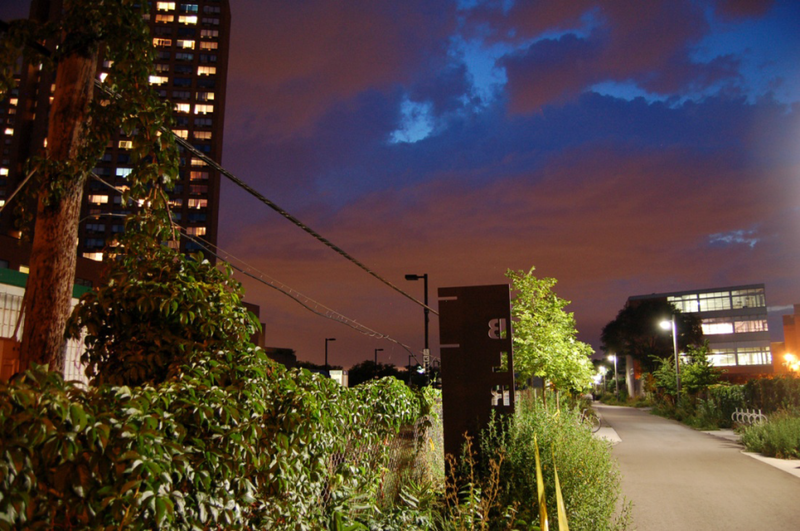 The West Toronto Railpath at Bloor Street at night. It’s not only the rail corridors where we have seen the opportunity to generate dual benefits seized. 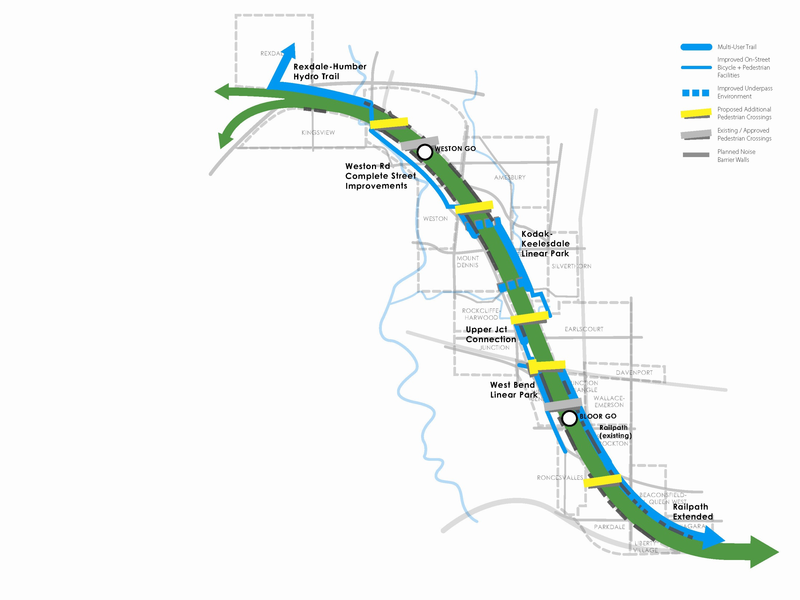 It's also become best practice to make use of hydro and utility corridors for active transportation and community appropriation, as seen on the Finch Hydro Corridor Trail. Rather than introducing an externality that will negatively influence neighbourhood appeal and real estate value, why not strive to build something that will actually enrich these things? This is the thinking behind Brown+Storey Architect's "green walls" as they look to build on the legacy of the Railpath. While ideas like this one are attractive in terms of design and quality of life measures, the added demands involved for government infrastructure funding is unrealistic at this time. As it stands now, Metrolinx has reviewed Brown+Storey’s proposal but there has been little indication thus far that it will be adopted in any substantial form. The plan is for electric trains to be implemented in about 10 years on the Georgetown line, but about two thirds of the barrier walls are being built to allow for the operation of diesel-powered trains, with construction now underway. It is likely a case of this project just not being in the budget---but dandyhorse will continue to follow the story and provide updates as they come.